The old Indian woman, a descendant of Cuba's Taíno-Arawak people, bent over and touched the leaves of a small tree. Her open-palmed hand lifted the round, green leaves in a light handshake. "These are good for inflammations of the ovaries," she said. "I gave them to all my young women." "She knows a lot," her daughter, Marta, said. "She doesn't need a pharmacy. You have something wrong with your body, she can make you a tea - un cocimiento - and fix you up." The mother and two sisters, part of a large extended family known in this town for its Indian ancestry, continued to show me their patio. Around an old well, where they wash their laundry, they pointed out more than a dozen herbs and other useful plants. The Cobas Hernandez clan, from which Maria and her several daughters, her son, Pedro, and his brothers spring, counts several living generations of families from here to the city of Baracoa, about 120 km west from Los Arados on Cuba's southern coast. 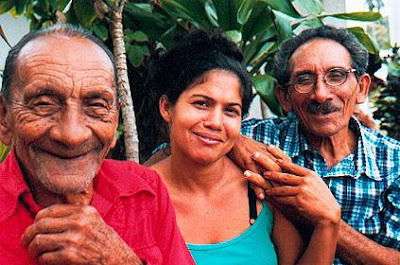 They are not the only such extended family and they are not the only people of clear Indian ancestry in Cuba still living in their aboriginal areas. It may surprise many social scientists that nestled in the mountains of the Oriente region (eastern Cuba), from Baracoa on the southern coast all the way to the Pico Turquino, the highest mountain in Cuba, there are numerous caserios, several barrios, and at least one community of more than a thousand Indian people. They were called Cubeños by Father Bartolome de Las Casas, who helped some of their communities to survive, and are ancestors of the original Taínos who met Columbus. In March and April 1989, I traveled to Santiago de Cuba to attend a conference, "Seeds of Commerce," mutually sponsored by the Smithsonian Institution and a Cuban research center, the Casa del Caribe. I took the opportunity to extend my visit for two weeks, first in the Baracoa-Punta Maisi region and then west to the plains country of Camaguey. I wanted to ascertain the veracity of testimonies that I had heard as a child and that have been recently published in Cuban academic journals, to the effect that Taino-Arawak descendants inhabit the eastern region of Cuba. I wanted to reacquaint myself with the people of guajiro background still prevalent in the Camaguey countryside. Thanks to Tomas Waribonex Luzojos of the Taíno Nation of the Antilles for finding this article. The Taíno Nation's Official Taino Nation News is an informative site for Taíno related articles, notices and commentary. Cultural Survival promotes the rights, voices and visions of indigenous peoples. Read other articles by Jose Barreiro published in Indian Country Today. The Cuban Taino DNA is going to be search by Juan Carlos Martínez Cruzado, a puerto rican scientist who recently found traces of Taino DNA in about 61% of the PR population. My hearts leaps with joy. I grow up thinking that the entire civilization of Cuban Indians were totally extinct; but I fund out today that they are Taino tribe descendants in Cuba and some emigrated to US, even reside in New York. Famous words "...We shall Remain" Praise the Lord Almighty and Creator of all things that watches over all his children. taino guanahan wiwa turey caraya-bo maguya, guaguancho casiguacha YAYA. How can those people live there is Cubans hate Native Americans.